Amid huge challenges in finding potential bone marrow donors, a major change in the testing process could prove to be the shot in the arm needed to identify the hundreds of thousands of donors required. At the moment, the process to test for potential donors is pricey, and quite laborious – when someone signs up to be a donor on the South African Bone Marrow Registry (SABMR), they could potentially undergo two separate tests. When testing to identify if a donor could be a match, laboratories would try to match three of the 11 loci (the proteins or markers attached to everybody's DNA known as human leukocyte antigens locus), and should they potentially match three, they would proceed to look at matching five. But, in a new development, NGO The Sunflower Fund has teamed up with the Centre for Proteomic and Genomic Research (CPGR) to speed up the testing process for donor blood and to do so more cheaply. 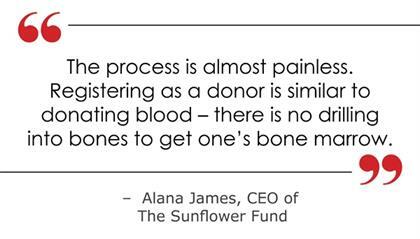 Alana James, the Fund’s CEO, said: “At the moment, the Sunflower Fund pays R2 500 for a 3 loci test. CPGR have managed, with all the negotiations in place, to currently bring that down to R2 100 for a 5 loci test. This partnership between the two non-profits cuts out the middle man – the 3 loci test – so that donors are added to the registry much quicker, and the waiting time for the patients is cut down considerably. CPRG’s Genomic Manager, Lindsay Petersen, told Health24 that using this method of testing cuts down on an incredible amount of time. “We are the first to be doing this in the country and our registry is going to be on par with other international registries. "Even though the test is being used overseas, some registries in other countries are not making use of it yet and continue to only test at 3 loci. This means that our database may end up being better than some of the other databases internationally,” says Petersen. The change in testing method makes all the difference in this instance. James Ross, CPGR’s bioinformatics analyst, said: “The difference between looking at 3 and 5 loci is due to an advancement in technology that’s available. We used to look at big blocks of DNA or looking at chemicals in the blood, and this meant we couldn’t go very deep into exactly what your certain type is. With the new technology acquired – next-generation sequencing (NGS) – we’re able to go deep. “There are 11 loci and we can look at 5 of them, and this is for a relatively low cost, we’re able to get a much higher resolution and match people more accurately than what we could match before. We don’t need to have a perfect match on all 11, even though, theoretically, you could find someone who matches on all 11. You just need to match quite closely to fool the immune system into accepting the other person’s stem cells. When looking at the amount of time saved on running tests for bone marrow donors, making use of NGS allows to cut time down from months to weeks.